The second edition of the acclaimed ARTMODE takes place this evening in the hype of Thursday Late Woodstock. It is a collaboration of art, music and creativity. Created with the aim of extending the reach of talented independent artists by including them in a pop up gallery with the unique attraction of LIVE art performances and live music. 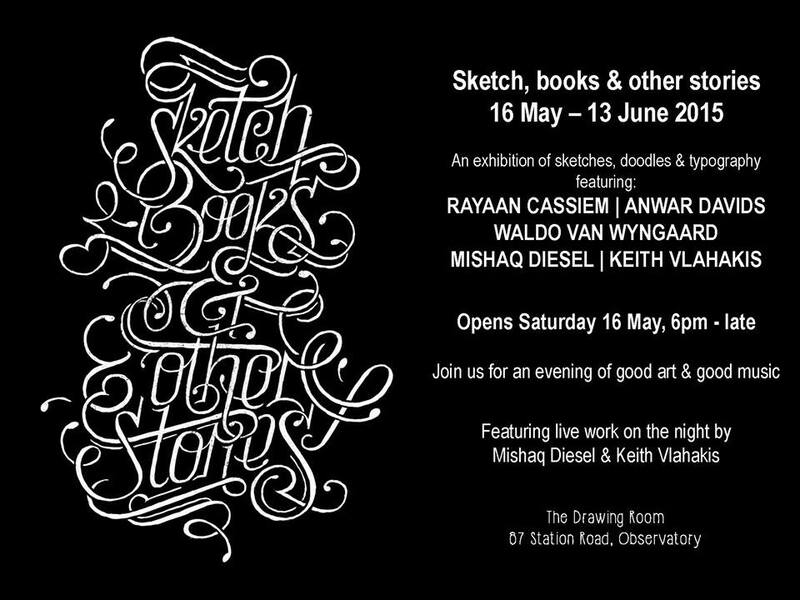 This exhibition features my friend Keith Vlahakis and many others showcasing their sketches, doodles and typography. A more interactive doodling event to look forward to next week Friday 29th May is Drink & Draw at Ruth Prowse School of Art in Woodstock. This is a great participatory outlet. As the 2015 winner of the TripAdvisor Certificate of Excellence as a direct result of consistently great reviews from TripAdvisor travellers, The Glen Boutique Hotel is most certainly the place to start your weekend oiled and revving to go. To celebrate the reopening of The Dragon Room the organisers are hosting Liquid Feel Fridays bringing you some of our best local talent and every bit of insanity this premium venue has to offer. We’ve got a new kid on the block, Hercules Dynamix (HDX), branding itself as a leading provider in premiere entertainment for the city of Cape Town to welcome the participation of the world. HDX is raising the standards in entertainment, aligning with the organized, the cutting edge, and most innovative of businesses to bring you international performers as well as the best in home grown DJs, venues, and spectacles. Their next instalment is entitled Heavenly House – today is the last day for pre-sale tickets to get your party on. Keep an eye on my blog for a feature interview with HDX’s Co-Founder and Creative Director, Eon van Zyl. Address: Jackal & Hide, 108 Kloof Street, Gardens, 8001. The last Thursday in May brings us a touch of fashion, wine and everything fine at TEMPORIUM 4.0 courtesy of The Avant Garden. The aim of The Avant Garden is to inspire a movement that sparks and enables growth amongst young, talented, creative professionals through “connecting creativity”. The event directs focus towards the accessibility and affordability of hot, local designers’ threads and accessories in a pop-up style sale with an air of exclusivity. All accompanied by the energy, creativity, conversation and networking that The Avant Garden ceaselessly inspires. You know you’ve made it as a blogger when you are added to the Press List (LOL). I am looking forward to interviewing Gabriela Fraser, Founder/Director/Designer of Gabriela Fraser Designs and The Avant Garden for an upcoming blog feature. So watch this space.